The Windy City of Chicago was the destination of this year’s math and science trip, Apr. 28-30, for junior and senior students enrolled in advanced math and science classes. 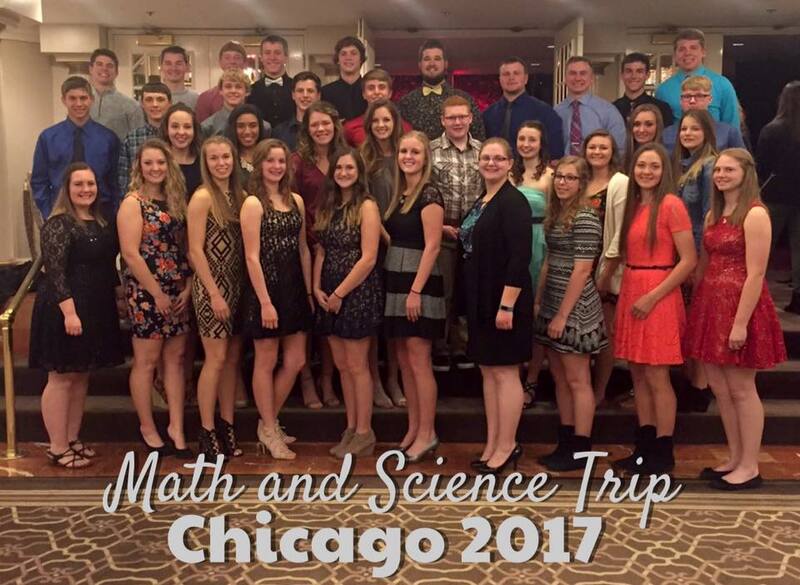 Math teachers, Mr. Dwight Beyer and Mrs. Heidi Van Wyk and science teacher Mrs. Allison Wenck started planning, making reservations, and purchasing tickets for the trip at the beginning of the school year. Students going on the trip paid $210 in three installments leading up to the big weekend. The group of 37 students and four chaperones left Sully early Friday morning. Upon the afternoon arrival at the hotel and eating at Portillo’s – a hit with the students – the group went on a shoreline cruise around Chicago, taking the architecture tour and learning more about downtown Chicago buildings and the city’s history. The students headed back to the hotel for the Drury Lane Dinner Theater where they ate dinner and watched “Chicago,” the musical. Saturday, the students got an early start and made their first stop at the Museum of Science and Industry. Next on the agenda was Shedd Aquarium. Students took the opportunity to touch large fish with the help of aquarium staff members. Then the students were off to Navy Pier, where they ate lunch and shopped. Once done at Navy Pier, they went to Willis Tower, where students stepped out onto the glass and experienced seeing Chicago from high up. Unfortunately, the students weren’t able to see much because of the fog. Later that night, the group ate Chicago-style pizza at Gino’s East Pizza, where they met up with L-S graduate Noah Zylstra. On Sunday, the trip was cut short because of the weather, so students were not able to go to the zoo. Instead, students arrived at home earlier and caught up on much-needed sleep.